I’ve been saying for quite some time that detached sales are well below historical averages. In September Detached Market Report I reported that East Vancouver had the fewest sales that September than any other September over the past 10 years. However, the Real Estate Board’s release went on to say that sales were returning to more normal historical levels. I’m almost certain it’s because they combined detached and attached sales. This can be quite misleading since we all know they are two very different markets. 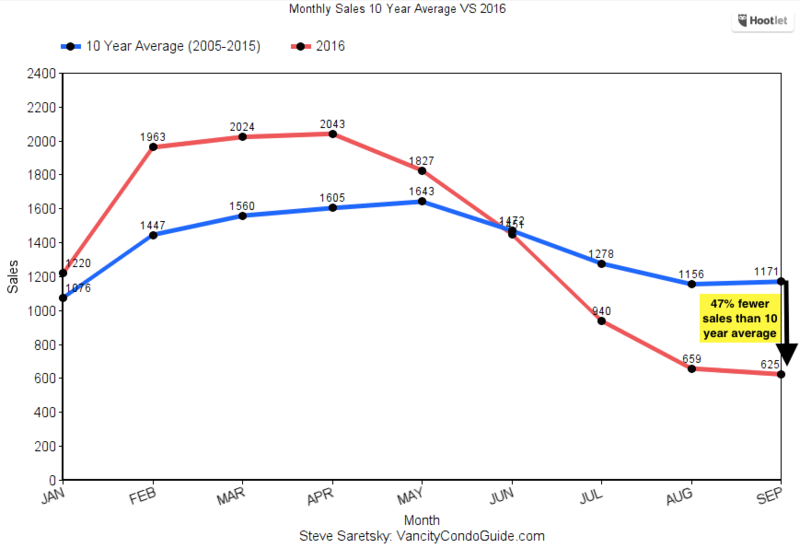 September 2016 sales 47% below 10 year average. Here’s the quick take away: July 2016 sales were 26% below the 10 year average , August 43% below, and September was 47% below the 10 year average (2005-2015). So clearly we are in very unfamiliar territory. Detached sales have plunged well below normal levels. I think what’s interesting is July 2016 sales were 26% below normal levels. The foreign buyers tax was introduced July 25 and implemented on August 02. This begs the question how much of the recent sales declines are a direct result of the 15% tax? How much longer will this historically slow trend continue? Early data shows October Sales Off to Slow Start. It’s also why I think if you’ve been contemplating selling it’s likely Time to Cash Out Vancouver Real Estate Profits. Next articleWhat is the ROI of Vancouver Real Estate?